Apparently there is 12 houses along the right of way of 600 West. Some say that TRAX will increase crime but that seem disingenuous since this is area is already has a crime problem. In fact they would get a street that is in much better shape that it currently is since street work improvements even if they are not needed for the project usually get "added" in. If it is built down 600 West the connection for the Intermodal Depot down 600 West and 400 South will be critical as it will allow for people to travel from the airport to hotels/motels along the Hotel/Motel Corridor. Here is pictures I took from my trip on Monday on the new systems first "real" day. 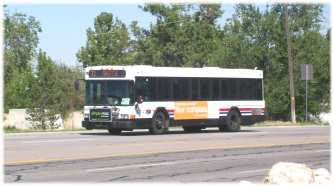 Here is the 1995 Gillig Phantom bus I rode from 1300 East/Spring lane to the 7800 South TRAX station. As I mentioned the driver was not friendly at all. Apparently the 213 turns into the 525 when it reaches the station. 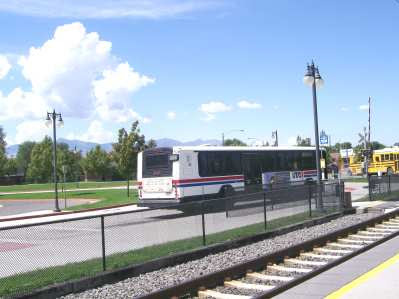 Next, here is a TRAX train at the Historic Sandy TRAX station. This was the train behind the one I rode. Here is the Flextrans bus they are using for the F94. They did paint F94 Sandy Lift on the bus but next stop buzzers have not been installed yet. I told the one lady that they should take some lessons from Denver's Call N' Ride which is much more useful than the F94. However, I was impressed with the number of riders on the F94, but that could be because the 207 no longer serves the station and the 33 is gone. Here are some pictures I took on Friday of routes that are no more and streets that have no or useless service. Here is two photos of Route 44 at South Union and 1300 East heading toward downtown. Here is a picture of Route 33 heading Southbound on 1300 East at about 7400 South. This routes cut can be directly contributed to the poor redesign done during the first TRAX line opening. Running this but all the way from 1300 East to TRAX was about the biggest blunder of the big blunders that UTA has done. Yet, UTA planners are not held accountable for this route's failure. The last two are a couple of pictures of the late Route 32. OK, the route is now Fast Bus 307 but only runs peak hours only toward downtown in am and back in the pm. Plus a majority of the bus stops have been discontinued. 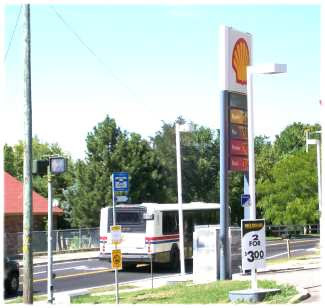 In fact in the second picture you can see one of the bus stops that will no longer be used despite the bus turning at this point. Tomorrow unless there is some earth shattering news I will post photos of yesterday's trip to Alta View. It's interesting to talk to Draperites. Old time Draper residents (including my in-laws) support the old UP right of way because it's the best route for the line. Then there are the new Draper Whiners like Pugh who don't won't the big evil TRAX trains near their Taj Mahals. Apparently they are so poorly built that they will shake apart if a TRAX train comes near. So what happens when some bozo with he radio blaring that creates more decibels comes by? Well today was the first business day dealing with the new bus changes. I got nauseated listening to Justin Jones on KSL tell how great this new system is. Of course the guy can be smug after all even though he was in charge of it he will not be held accountable if/when it proves to not be a success. Now if Jones was willing to put his job on the line against the performance of the changes that would mean something. Of course then it would be tied to ridership which of course is a meaningless number. Then there was John Inglish making his pitch. He said he took route 346 from his Draper Estate to the TRAX station. He said that there was many more riders than normal. Define many more! Of course he failed to mention that the 346 was one of the first experiments in "Fast Bus" and has already had service cut because it was a failure. Maybe he's afraid of losing his bus route. Interesting is that I had to take a little journey today because my wife had an doctors appointment at Alta View Hospital. Now the easiest way for this to happen would be for me to take the 32 right near our apartment to where she works in an office at 3500 East/Bengal Blvd behind Smiths. But that's right no more 32, that's why my wife can't take the bus anymore, scratch that one. So I decided to meet her at the hospital. Normally I would walk and take the 45 over to TRAX but decided to take the direct way this time to see how the bus routes were doing. So I rode the 213 from 1300 East/Spring Lane to the 7800 South TRAX station. Of course the 213 was the 11. I got to the bus stop about a minute before the bus was due at 4500 South. I waited, and I waited, and I waited until finally the bus came running about 10 minutes late. Strange thing is there was only 2 passengers on the bus which used to carry more than that. Could it be that the bus has loss ridership because it no longer goes downtown and has poor connections to get downtown? Hum?? Both passengers got off by 6400 South so I was along on the bus with a female driver with absolutely no personality. She either needs customer service training or needs to find a new job. Along the whole former 27 portion of the route there was not a single passenger. Once again, could this be because there is not direct link to downtown anymore? Every time I rode the 27 (and it used to be frequently) it at least had three or four passengers on this section so where were they? I addition we saw both the 207 and the 201 which were running empty. 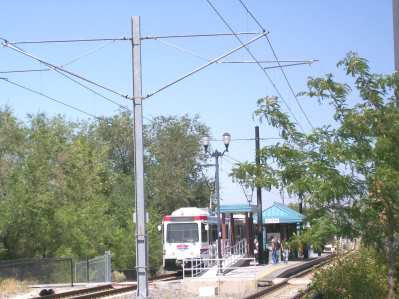 I then took TRAX to the Historic Sandy TRAX station. From here I had about a half hour wait for the F94. The cutaway van showed up and it actually had a good load and two other people got off at the hospital with me and total ridership on my short section 7 passengers. Not bad for a route that had no off peak service for a year and has a joke of a headway (every 80-minutes). There was a driver and a helper on the F94 and they both were extremely friendly. The one lady helping the driver (who is out of the Flextrans fleet and didn't know how to do transfers) mentioned that they are talking about another Flex route for Draper. I will go into detail about the F94 and comparing it to the Denver Call N Ride later in the week. Who and remember about all the people UTA had out to help you today? At 1:00pm when I started this trip I did not encounter one UTA person out to help. Not a single one at either TRAX station just the lady on the F94 who was actually there to help the driver. So I guess they only cared about the commuters and not the people during the day. 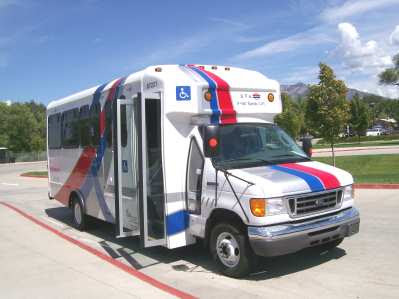 Today the UTA bus redesign took effect. But don't worry there will be lots of UTA people out tomorrow to help you. The only problem is that they will primarily be at TRAX stations and downtown plus a few other places. Oh and they will be on the buses also. So what's wrong with that? Well where they plan to have people is where people transfer off of buses onto TRAX or another bus or have already arrived at there destination. Of course at least they will have people out there because there will be a lot of confusion and many of the drivers will not be helped because they more confused than the passengers. Too bad gambling is illegal in Utah or we could have a pool on what UTA's 2008 revenue would be. Does anyone find it interesting that all this just happens to be coming out the week they make the big bus changes? As I have stated before ridership numbers of meaningless. What really matters is revenue, load factors (something that UTA doesn't even figure out and would be hard until they start doing a better job of assigning buses), revenue per passenger mile, equipment utilization, etc. Apparently they need ridership numbers for the national database--BIG DEAL and also for federal funds. Now since operating funding was eliminated years ago why do they need ridership numbers? Apparently for preventive maintenance funds. Makes no since at but if there is something that make less sense that the UTA its federal programs. Oh well, tomorrow I will be out taking pictures of some of the lines that will be no more tomorrow. Remember the vote that was held in 2000? Not only was there to be a terrific expansion of TRAX service but also we were to see expanded bus service. 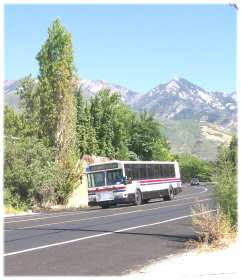 If you will recall the UTA at the time showed the expansion of service over the next 20 years. Well here we are at 7 years and what have we seen? The number of bus routes going down and starting next Sunday a severe cut in bus service (oh that's right, according to the UTA's propaganda machine its a reallocation of service). 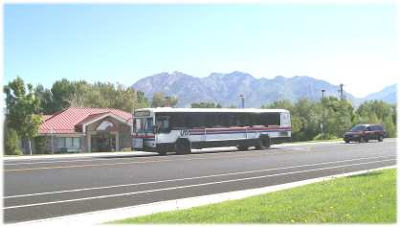 Yet according to the map from 2000 we would see expansion of service including new service along 7200 South and 9000/9400 South, more transit centers, the new 6200 South bus traveling all the way to Cottonwood Corporate Center, extension of service along 5600 South, etc, etc, etc, etc. 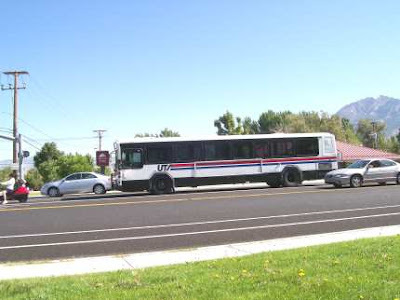 Instead service is being cut to useless on 7200 South (Fort Union Blvd section), we have seen no transit centers, service along 9000/9400 south is a joke, the new 6200 route only services the westside, no extension of route 84 (sorry new route 54) to the east, etc, etc, etc. So where is our expansion UTA? Also here is the picture of the interior of a Bombardier car like UTA will be using. 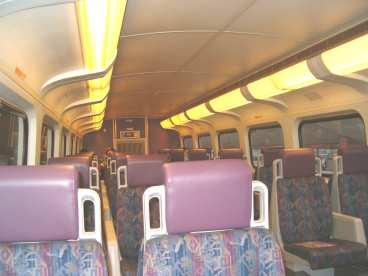 This one is in service on Metrolink in Los Angeles. Don't let the empty car fool you, I was the first passenger on the train at the end of the line station and this four car a train was standing room only 3 stops down the line and it was a Sunday!! It looks like there are people here in Salt Lake City with the help of Utah Jobs with Justice trying to form a Bus Riders Union. They are using the example of the Bus Riders Union in Los Angeles. Well here is everything that is wrong with that. The BRU in Los Angeles got early publicity by using the race card saying how bad bus riders are treated (the irony is that the executive director of the BRU is white and makes a six figure income). They filed a discriminate lawsuit against the LACMTA that runs LA's transit system and MTA settled instead of fighting creating the consent decree. The BRU was an interesting organization. It was part of an extreme left wing "social justice" organization. They started by trying to force General Motors to keep their San Fernando Valley manufacturing plants open. While they kept them open for a while the plant eventually did close. While the BRU was an extreme left wing organization it was often help by anti-transit right wing extremist organizations in order to stop rail transit. This included a former employee of the Southern California Rapid Transit District (that became the LACMTA with the merger with the Los Angeles County Transportation Commission) and another LA County Transportation Commission member that became a highway lobbyist. There was also a connection with the Heartland Institute right wing think tank that gets most of its funding from Wal-Mart, CITGO, and Exxon. With the consent decree the BRU kept LACMTA from raising fares, buy a large number of new buses, and add routes some of which made no economic sense. They also tried to demean rail transit as being racist and other race card attempts. The consent decree has finally expired and but not before a lot of damage was done. Over the 10 years of the consent decree the BRU lost its credibility especially after supporting the bus drivers instead of its "riders of color" who had no alternative during the strike. While the people the BRU was supposed to be helping couldn't get to work Eric Mann drove to work in his brand new BMW. While I think that UTA has made mistakes and is too typical of transit systems across the country that operate themselves as government monopolies and treat their riders as so, the BRU is a bad idea. After 10 years the LACMTA is worse off than it was before. Service is having to be cut in many areas. We could end up with a system that covers only West Valley and Salt Lake and other areas loose service and that's that last thing we need. Timetables for FrontRunner and TRAX line construction..
-Good luck with the first article as it appears that the Deseret News is having troubles with their website today. It looks like in three and a half to four years we could be riding TRAX to Daybreak and another year and they will add the line to West Valley. That same year you will be able to travel on Front Runner from Salt Lake to Provo. Think they will have enough common sense to run the trains through Salt Lake and not have them operate as two separate lines?? It looks like UTA is moving along with the FrontRunner project. The last time that I surveyed the line there was still many sections without rail so they are moving along quickly. 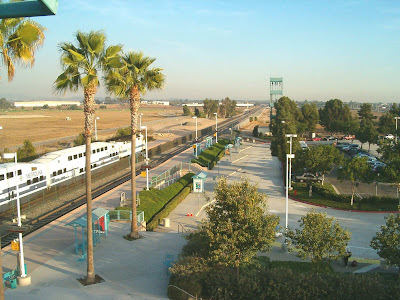 Here is a picture I took last November of a Metrolink train that I rode from the Anaheim station down to Irvine in Southern California. UTA will be using the same cars but different locomotives. I have taken a few trips on Metrolink in the last year and have found the Bombardier cars to be extremely comfortable, smooth riding and quit for the most part. The seats are nice for short journeys (I would not want to ride on them for more than a couple of hours but for commuter trains their great). In a few months we can ride the cars here! Yes there is some good ideas that come out of UTA headquarters. Wow, it would only take me three hours to get to the Intermodal Depot that is only 25 minutes or less by car. Oh and remember that I put in that I needed to be there by 10:00pm and it shows me getting there at 10:31pm!! 1. The 45 is only a few blocks walk for me. 2. The bus up highland drive is a 20 minute walk. 3. Notice it would have me go all the way from the Murray North TRAX station to Wasatch and 3900 South then proceed (same bus goes from 45 to 39) back to 900 East to catch the 209. I think the computer guys still have some work to do on this new system! !